With exactly seven days left to prepare for "Africa's Richest Race Day", we had to tap into some expert advice as we put our looks together. 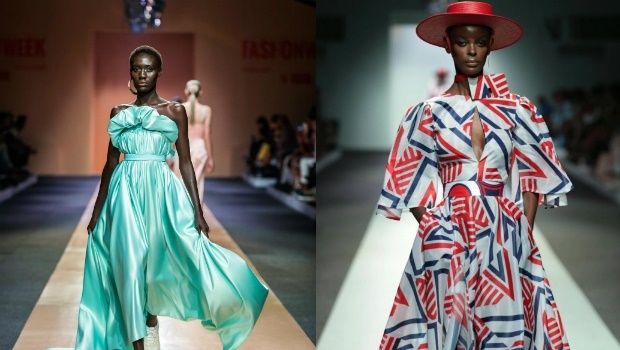 Saturday 26 January 2019 marks one of the biggest events on South Africa's fashion calendar, the Sun Met in celebration with G.H Mumm. Of course, there will be horses racing, but year after year the first race begins on the red carpet. With recent Sun Met themes encouraging attendees to embrace certain aspects of our African heritage, this is an opportune time to pop some champers for local designers and let their creations sparkle at Kenilworth Racecourse like bubbly in a flute. This year's theme is African Luxury: Precious Metals - simple enough to interpret, but still worth noting that although there will be a red carpet laid out, this is a day at the races so do proceed with daytime-conscious caution. This is why I thought it best to chat to two highly acclaimed local designers ahead of 2019's Sun Met - Matte Nolim and Mzukisi Mbane of Imprint ZA. Johannesburg-based designer Matte Nolim, whose bio reads "Cross Dressing between Aunt and Niece", boasts features in both Vogue and Forbes. While Matte can not yet confirm nor reveal which local star they might be dressing for the Met, he does have these three suggestions for anyone else considering being dressed by this designer. This ensemble ought be "a winner", according to the mastermind behind it. This is the designer's top suggestion, because it will do well based on the design. It sweeps the floor, while showing off your shoes as well. Based purely on the silhouette and design of this dress, Matte Nolim thinks it's also worth a go. Matte Nolim's go-to fabric is satin and as a result, his interpretation is that "precious metals would have to be a luxurious fabric," highlighting the correlation between the words "precious" and "luxury". Silk satin and duchess satin would be best for this occasion, the designer advises. "Shy away from traditional red carpet style and lean more towards cocktail/high-end daytime dress." Matte Nolim is based in Houghton and the collection items are made to order with a turnaround time of maximum two days, so you still have time. Connect with Matte Nolim on Instagram. Cape Town-based designer Mzukisi Mbane of Imprint ZA is known for his distinct signature print loved by many style enthusiasts. This year, the designer's muses include Lerato Sengadi, Gugu Khathi and Afternoon Express' Palesa Tembe. Mzukisi tells us he'll be sticking to the signature (Im)print at this Sun Met as well, while creating looks that portray "a fusion of print with metallics," as the theme clearly lends itself to this idea. The three celebrities that will show up in Imprint ZA at the Met will therefore represent different types of African royalty and luxury, including headpieces made from scratch. With American Swiss as an official sponsor of the race day, the designer will also incorporate statement jewelry pieces. Mzukisi's top suggestion to anyone looking to dazzle in one of his creations is based largely on comfort. "Be careful how you interpret this theme. Instead of wearing something super shimmery, wear something [more balanced]. No one can take a picture of you if you're reflecting on everything." Imprint ZA is based in Woodstock, Cape Town. Connect with Mzukisi Mbane here. We may not have spoken to Crystal Birch, but everybody knows the most essential accessory for a day at the races is an extravagant hat. A popular go-to among style circles in Cape Town, this is the milliner to call up for the ultimate finishing touch to your Sun Met look.